This course is intended for people preparing to translate Latin litugical texts into the vernacular at the service of a national conference of Catholic bishops. This programme is sponsored by the Congregation for Divine Worship and the Discipline of the Sacraments and run by the Pontifical Liturgy Intsitute and held at the Pontifical Athenaeum of Sant’Anselmo, Rome, and will be conducted in English. We shall use the system developed by Reginald Foster, papal Latinist for four popes over 40 years, as presented in the volumeOssa Latinitatis Sola. 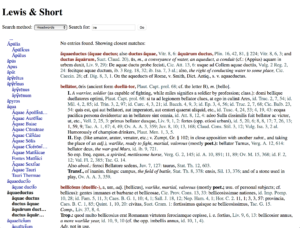 We shall frequently refer to the: Lewis– Short, A Latin Dictionary. During our encounters we shall read texts from every era and genre of liturgical Latin for a patient and careful understanding of the Latin text, and we shall render them into clear English. For a basis in classical Latin we shall consider brief texts from Cicero’s letters to friends. Three times a week a brief Latin text or two will be provided for independent, supervised study to be reviewed during the next encounter. 3. understood the ambiguities of each language. Two daily encounters from 8:30-10:05 and from 10:15-11:50 on Mondays, Wednesdays and Fridays from 6 May to 14 June, totals 16 mornings or 32 encounters. During our encounters we shall read texts from every era and genre of liturgicalLatin for a patient and careful understanding, and we shall render them into clear English. For a basis in classical Latin we shall consider brief texts from Cicero’s letters to friends. Three times a week a brief Latin text or two will be provided for independent, supervised study to be reviewed during the next encounter. Participants prepare for each day’s session by completing the independent study from the previous session and by reading the encounters assigned for that day in the volume Ossa Latinitatis Sola. We shall begin each day’s session by reviewing the independent study texts from the previous session. Most of our time will be spent considering Latin texts and their English meanings, drawing from: scripture, prayers, musical texts, rubrics, general instructions, the martyrology, the lectio alterafrom the office of readings and magisterial documents on liturgy. While doing so, the instructor will give a summary of the material presented in the encounters on that day and show how that material is exemplified in the texts considered. We shall typically consider a brief quote from one of Cicero’s letters to friends. Topics: We shall move at the pace of the participants as we consider Latin liturgical texts exemplifying elements of the Latin language presented in the 105 encounters of the book Ossa Latinitatis Sola. Because we may have learned Latin in different ways, we shall begin with some basics to introduce this system to all. If we take as much as the first week for review the essential elements from the First Experience in the Ossa book, thereafter we shall have just about one topic to consider per encounter from the Third and Fourth Experiences. Some material may take more than one day such as reported speech. Evaluation: This part of the programme does not involve any exam or evaluate the progress of any participant. Personal evaluation may be based on one’s participation in class sessions and the completion of the regullarily provided texts. FOSTER, R.T. – D.P. McCARTHY, Ossa Latinitatis solaad mentem Reginaldi rationemque: The Mere Bones of Latin according to the thought and system of Reginald(Latinitatis corpus 1), Catholic University of America Press, Washington DC 2016. Appreciating the Collect:An Irenic Methodology(Documenta Rerum Ecclesiasticarum Instaurata, Liturgiam aestimare : Appreciating the Liturgy 1), ed. J.G. Leachman – D.P. McCarthy, St. Michael’s Abbey Press, Farnborough, England 2008 (information and purchasing). FERNANDO, R., Deus, auctor pacis et reconciliationis: A Euchological and liturgico-theological analysis of peace and reconciliation in the Missale Romanum, KU Leuven, PhD – STD Thesis, 2018 (available in the Sant’Anselmo library). 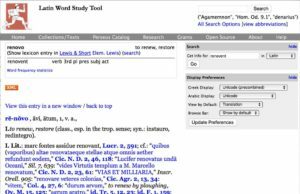 McCARTHY, D.P., “Listen to the Word” Commentaries on the proper prayers of selected Sundays and feasts,The Tablet(4 March 2007 – 27 November 2011) available in the Sant’Anselmo library (information). ________, “Seeing a reflection, considering appearances: The history, theology and literary composition of the Missale Romanumat a time of vernacular reflection”, Questions Liturgiques / Studies in Liturgy94 (2013) 109-143. Transition in the Easter Vigil: Becoming Christians.Paschali in vigilia Christiani nominis fieri, ed. D.P. McCarthy – J.G. Leachman (Documenta Rerum Ecclesiasticarum Instaurata, Liturgiam aestimare : Appreciating the Liturgy 2), St. Michael’s Abbey Press, Farnborough, England 2011 (information and purchasing). Contact: The instructor requests that you not phone him. Rather, please contact him via email at: danielmccarthyosb AT mac DOT com. © D.P. McCarthy, created on 10 November 2018.